Last week, I got a chance to interview Bruce Campbell over the phone. Amongst our topics of conversation were his new memoir, Hail to the Chin: Further Confessions of a B-Movie Actor, a sequel to his 2002 book, If Chins Could Kill, and his upcoming 35-city book tour. 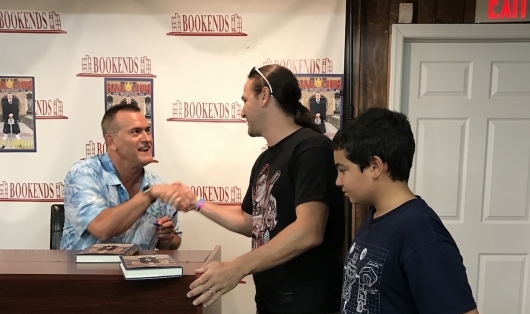 Well, yesterday in New Jersey the tour commenced, and I was there with my son to meet the man, the chin, the legend, Bruce Campbell and get my copy of his book. The book signing took place at Bookends, located at 211 E. Ridgewood Ave, Ridgewood, New Jersey.